The History of the German Steel Helmet 1916-1945 (1985) by Ludwig Baer. Despite it's title, this 448 page book includes substantial information about post WW II German steel helmets in police use. UNIFORMS OF THE GERMAN SOLDIER - An Illustrated History from World War II to the Present Day (2006) by Alejandro M. de Quesada. 223 pages including numerous color & black & white photographs & illustrations of both BW & DDR Soldiers. After getting organized, I'll identify other books for comment. Thank you. This English language book is a compilation of Baer's three volumes on German helmets in German. The majority of the information on post war helmets was left out of the English edition. Both BRD and DDR. I refer to the three volume German language edition often. I rarely look at the English edition. The post war helmet information is primarily confined to volume two. I am just going through Uniforms of the German Soldier again because it has sat in my book shelf for some time without being opened. There are much better, and more recent books, for the study of BRD and DDR uniforms although this book is worth having because it shows uniforms in period wear. It is too bad so many of the photos are in black and white. Thank you, Gordon! This sort of feedback is helpful. When you have a moment, please look at the upper photo on page 155 of De Quesada's book; captioned. "Assault troops boarding a rubber raft. Of interest is the steerman wearing a Second World War-vintage German steel helmet, while the others are wearing American-style helmets." Upon close inspection, I see four helmeted-Soldiers, all wearing what appear to be German M-35s & no "American-style helmets" (all others are bare-headed or wearing caps). My thought is that this photo is of an early 1950s Bundesgrenzschutz (BGS) river-assault & not a later Bundesheer exercise, as the author suggests. What do you think? WEHRMACHT CAMOUFLAGE UNIFORMS & Post-War Derivatives (1995) by Daniel Peterson. WAFFEN SS CAMOUFLAGE UNIFORMS & Post-War Derivatives (1995) by Daniel Peterson. The author, Peterson, has performed extensive research while writing these two paper-bound books. He reveals the significant impact WW II German camouflage patterns had on both sides of the Iron Curtain. His books are filled with high quality, color photographs of substantive detail. Before reading Peterson, I was totally unaware that BGS's first camouflage uniforms were reversible white to an unusual splittermuster of very pale gray coloration. Is anyone here familiar with Daniel Peterson's books? I agree with your thoughts on page 155. Definitely early BGS camo. I've posted a close up picture of this camo in wear plus helmets of the period. It is dated 30 June 1957. 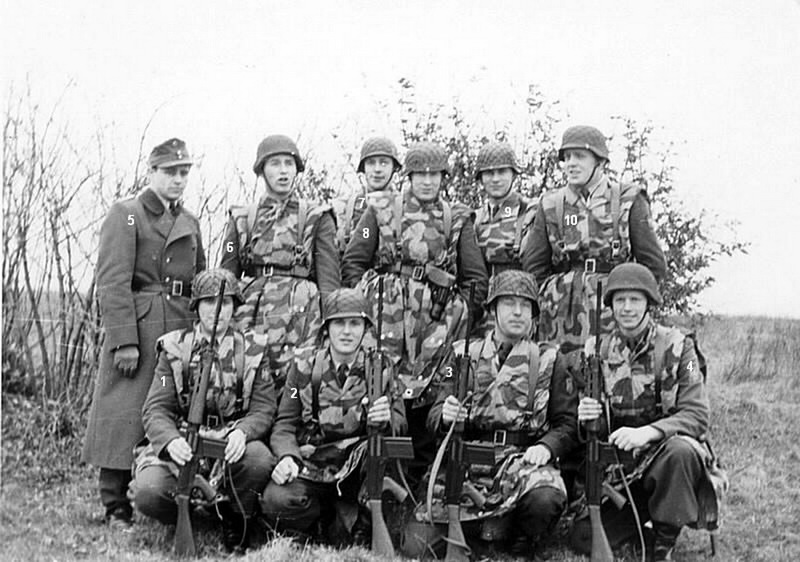 Early BGS wore reworked M35 and M42 Wehrmacht helmets even after the M53 helmet started to be issued. As for the two books by Dan Peterson, I have both and they are a good place to start in researching these types of camo. You can find much deeper research on this type of camo on the BRD sub Forum of the WAF which I moderate. I have an early BGS shelter quarter and they are totally white on one side. There are a number of variations of BGS camo as well as similar stuff that was worn by the Berlin Bereitschaft Polizei. Lots of room for research here. STAHLHELM - EVOLUTION OF THE GERMAN STEEL HELMET (1971) by Floyd R. Tubbs. A 104 page soft-back filled with illustrations, black & white photographs, & some text. Several pages are dedicated to post-WW II developments, both Western & Eastern. Katalog Deutschland-Europe-Ubersee Stahlhelme Von 1915 bis zur Gegenwart (1978) by Franz Thaler. A small 4"x6" 242 page soft-back filled with a large selection of black & white photographs of steel helmets employed world-wide from 1915 to time of publication -- a handy reference guide for collectors. Each photo has a short caption in both German & English languages. Hoping you'll find these a good addition to this subject.